A comparison between the cut British DVD by Warner Home Video (BBFC 18) and the uncut German DVD by Warner Home Video (FSK 18). 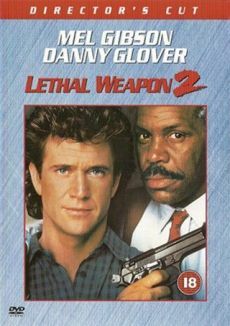 After the South African ambassador's henchmen tried to drown Martin Riggs, the following revenge on his tormentors was cut. Missing is, how he strangles the first one with a chain and then breaks his neck. He smashes the other one face first through a car window, then holds him down on the passenger's side and smashes the door shut four times. During the showdown on the ship 'Alba Varden', Riggs unloads his entire clip on an enemy. The UK version only shows the first 4 shots. At this point, there is a goof to be seen in the German Director's Cut. The shirt of the guy who's getting shot gets riddled with bullets, but in the last shot its undamaged.